It has been agreed that in future school fees (KES 400 or £3 per child per term) will be paid electronically by Mpesa (98% of Kenyans use Mpesa on their mobile phones) which will make it much easier to track the payment of fees. It is very fortunate that one of the school governors, Stephen Sakita is a qualified accountant and that he has agreed to prepare the accounts. To ensure complete transparency, the school fee accounts, detailing income and expenditure, will be posted every month on a new notice board to be fixed on an outside wall of the staff room/office. When we last visited the school in February, we were very concerned to receive complaints from the teachers that there were not enough textbooks and that the children were having to share. The provision of textbooks is the responsibility of the government and to get round this problem, we gave the School a loan of £578 (KES 76,707) to purchase a sufficient number of books to eliminate sharing. The loan has just been repaid. “You will recall that the government stopped allocating money for the purchase of textbooks when it rightly discovered that the money was being mis-appropriated. 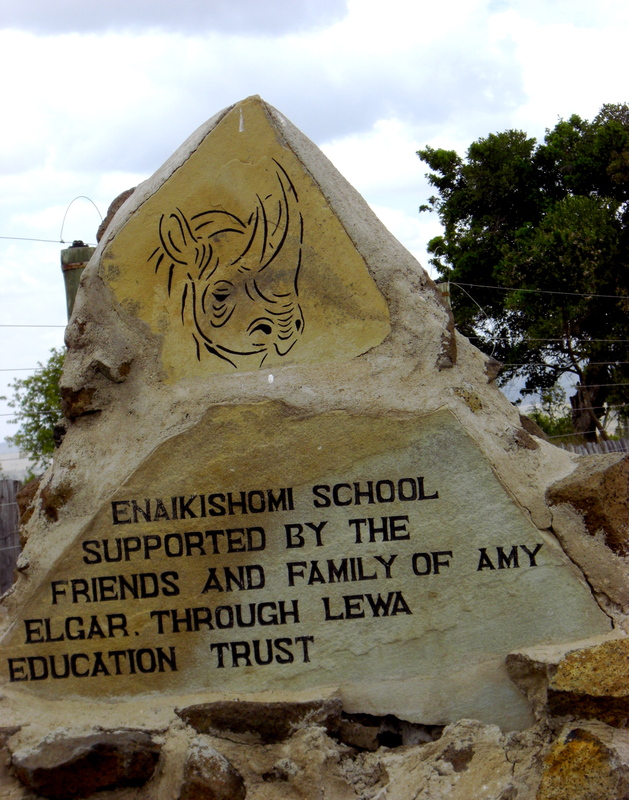 With the Ministry of Education (MoE) now having taken up responsibility to buy books for schools, some institutions have been sorely affected by delays.” We have emphasised to all of the teachers and members of the Board of Management that the Amy Elgar Trust will intervene with a loan to ensure that every pupil at Enaikishomi has his or her own textbook. At home most of the children speak a Maasai dialect, Ma which is understood by very few other tribes. At school, all the children have to speak (and are taught in) Kiswahili on Mondays, Tuesdays and Wednesdays and they change to English on Thursdays and Fridays. Any child that speaks in Ma at school is punished. The miscreant is presented with the “Bone of Shame“ and has to carry it around with him or her for the rest of the day ! Can you imagine how English children would react if they were forced to speak French on Mondays, Tuesdays and Wednesdays and change to German on Thursdays and Fridays ? It is truly remarkable that the Enakishomi children are all trilingual and have a good command of written and spoken English and Kiswahili. It is a tribute to the commitment and dedication of the teachers that not one of them stops work at the end of the school day at 3.30 p.m. They are all involved (in their own spare time) in one way or another with the many after school clubs covering a range of activities such as …Art, Health, Chess, Mathematics, Debating, Games (athletics, football, volleyball and netball), Choir, Science, Environment, Red Cross and Scouts. During our visit it was decided to form a sewing club so that some of the older girls (and boys) can be taught to use the sewing machines. These clubs are a great supplement to the rather rigid Kenyan curriculum. It is not surprising that very few children – other than the very young ones – leave before 5.00 p.m.
During our visit we were treated to some competitive games of chess and football but alas the school team proved too strong for the teachers and visitors who lost 5 to 1 ! It is a tribute to the environmental club that the school compound is free of rubbish and litter. Under the guidance of a local neighbour, Ms Wigi Cox and teacher, Trizia the Art Club hosted some children from Makuru, one of the poorest slums in Nairobi. They produced some colourful paintings on the the theme of “Water is Life “ which were on display. There are plans for six children from Enakishomi to visit their new found friends in Nairobi. The school toilets were installed when there were around sixty children attending the School. They are traditional “long drop“ loos and are no longer fit for purpose given the dramatic increase in numbers to over two hundred and sixty pupils. In the spirit of Enakishomi pioneering new technology, we have decided to install a range of composting toilets which promise to be more sanitary than the “long drops” (not difficult !) while at the same time producing compost for the school garden. We are very pleased that a friend of a friend, Frank Millsopp has volunteered to advise on the design and construction of this new facility. Frank has extensive experience of sanitation in East Africa and we are confident that this ambitious project will serve as a model for other schools in Laikipia. The interviews with staff can reveal unusual problems. Teacher, John Eris told me there was a problem with the fence around the football field. How you might wonder can a fence be a problem? John took me to the field and pointed out that the old fence had a line of barbed wire to deter the wild animals. This was the reason why so many footballs were punctured and unusable! Thankfully the school governors were aware of the problem and had decided to use some of the money they received from the Lewa marathon to install a new chain link fence. The old fence with the barbed wire will be moved to the vegetable garden to help Dan deter the marauding porcupines who apparently have been ravaging his crop of sweet potatoes! Our granddaughter, Rose made a memorable comment as we left Enaikishomi School. “I like the School”, she said. “Everyone is so happy”.